I recently took my daughter on a picnic to Veterans Oasis Park in Chandler, AZ. This park combines walking and hiking paths with a urban fishing lake, a man-made waterfall, and a number of recharge basins. As a relatively new park, the landscaping is immature and there is a lot of future potential. On a side note, I've been a bit discouraged that they haven't planted a few more riparian trees and shrubs, but that is a topic for another day. with streak extending up towards its back - a prime identifying quality of a Black-tailed Jackrabbit, Lepus californicus. 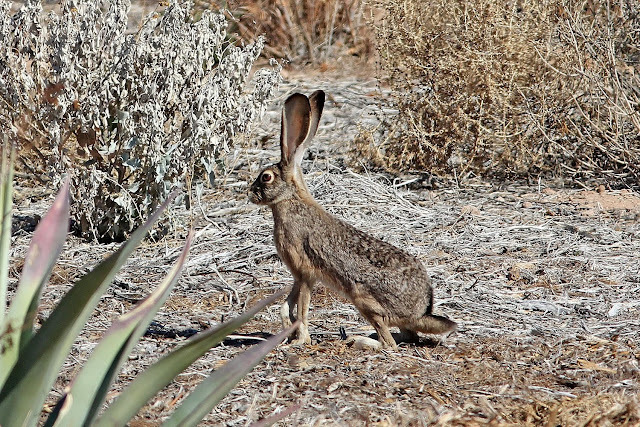 Black-tailed jackrabbits are quite large - reaching 18" in height and up to 6 pounds. Their large ears are thought to help with thermoregulation. And their powerful legs can propel them to 20 foot leaps and 35 miles per hour. Black-tailed jackrabbits are probably the most common jackrabbit in the Phoenix area, though an occasional (and larger!) Antelope Jackrabbit may be encountered (I saw one a Papago Park in the middle of the city one time). These fun to watch rabbits inhabit much of the western USA, whereas most other jackrabbits are limited to certain fringe habitats.